A recent market study published by PMR – “Disposable Medical Supplies Market: Global Industry Analysis 2013–2017 & Forecast 2018–2026” – does a comprehensive assessment of the most important market dynamics. On conducting a thorough research on the historic as well as current growth parameters in the Disposable Medical Supplies market, growth prospects of the market have been obtained with maximum precision. The report features unique and salient factors that may have a huge impact on the development of the Disposable Medical Supplies market during the forecast period. The report will help market players modify their manufacturing and marketing strategies to envisage maximum growth in the Disposable Medical Supplies market in the coming years. The report provides detailed information about the current and future growth prospects of the Disposable Medical Supplies market in a most comprehensive manner for the better understanding of readers. The report commences with the executive summary of the Disposable Medical Supplies market, which includes a summary of the key findings and key statistics. It also includes the market value (US$ million) estimates for the leading segments in the Disposable Medical Supplies market. Readers can find information about taxonomy and definitions of the Disposable Medical Supplies in this chapter. This chapter will also help readers gather basic information about Disposable Medical Supplies market dynamics, supply chain, cost structure, pricing analysis, key distributors and suppliers and key market participants. Based on product type, the Disposable Medical Supplies market is segmented into Drapes, Feeding Tubes, Gloves, Gowns and Procedure Kits and Trays. In this chapter, readers can find information about key trends and developments in the Disposable Medical Supplies market and market attractive analysis based on product type, Drapes, Feeding Tubes, Gloves, Gowns and Procedure Kits and Trays for each region. Based on end users, the Disposable Medical Supplies market is segmented into Tier 1 Hospital (>500 Beds), Tier 2 Hospitals (250-500 Beds) and Tier 3 Hospitals (<250 Beds). In this chapter, readers can find information about key trends and developments in the Disposable Medical Supplies market and market attractive analysis based on end users for each region. This chapter explains how the Disposable Medical Supplies market will grow across various geographies, such as North America, Latin America, Europe, Asia-Pacific including Japan, China and Middle East & Africa (MEA). This chapter includes detailed analysis of the growth being observed in the North America Disposable Medical Supplies market, along with country-wise assessment for the U.S. and Canada. Readers can also find information on regional trends, regulations and market growth based on product type, end users and countries in North America. Readers can find detailed information about factors, such as pricing analysis and regional trends, impacting the growth of the Latin America Disposable Medical Supplies market. This chapter also discusses the growth prospects for the Disposable Medical Supplies market in leading LATAM countries, such as Brazil, Mexico and Rest of Latin America. Important growth prospects for the Europe Disposable Medical Supplies market, based on product type and end users, such as the U.K., Germany, France, Italy, Spain, Russia and Rest of Europe, are included in this chapter. Australia, China, India, Japan and Rest of APAC are the leading countries in the Asia pacific region and are the prime subject of assessment in this chapter on the Asia Pacific Disposable Medical Supplies market. Readers can find thorough information about the growth parameters in the Asia Pacific Disposable Medical Supplies market during the period 2018–2026. This chapter provides information on how the Disposable Medical Supplies market will grow in major countries of the MEA region, such as Saudi Arabia, South Africa and Rest of MEA, during the period 2018–2026. In this chapter, readers can find a comprehensive list of all the leading stakeholders in the Disposable Medical Supplies market and detailed information about each company, including company overview, revenue shares, strategic overview and recent company developments. The players featured in the report include Covidien Ltd. (Medtronic PLC. Company), Cardinal Health., 3M, Medline Industries, Inc., Sempermed USA, Inc., ANSELL, Mölnlycke Health Care AB, NIPRO, McKesson Corporation and Halyard Health, among others. This chapter gives an understanding of the acronyms and assumptions that provide a base to the information and statistics provided in this report. This chapter will help readers understand the research methodology followed to obtain various conclusions, important qualitative information and quantitative information about the Disposable Medical Supplies. Hospital-associated infections in patients are caused during medical care. Nosocomial infections account for a 7% share in developed countries and 10% share in developing countries. According to the WHO, 15% of total patients in hospitals suffer from hospital-acquired viral, bacterial and fungal infections. In 2014, the results of HAI Prevalence Survey were published and according to the report, HAIs in the U.S. were 722,000 in acute care hospitals and nearly 75,000 deaths were reported during hospitalization due to healthcare-associated infections. To prevent and reduce the prevalence of hospital-associated infections, several measures, such as the use of sterile and disposable products, procedure kits and trays, sterile medical devices, disposable gloves and other disposable medical supplies, are being taken. The Disposable Medical Supplies market is expected to witness lucrative growth due to increasing cases of surgeries. Disposable Medical Supplies products reduce the burden of work and allow easy and efficient workflow. The strengthening of healthcare infection prevention standards will positively impact the Disposable Medical Supplies market during the forecast period. These days, low-cost Disposable Medical Supplies are replacing high value-added single-use products during surgery and general patient care, which will drive the growth of the Disposable Medical Supplies market. Increasing demand for Disposable Medical Supplies, especially gloves, due to increasing awareness among workers regarding hygiene and health is the major factor fueling the market of Disposable Medical Supplies across the globe. Increasing cases of infections during surgery and maternity care as well as hospital-acquired infections have led to growing demand for Disposable Medical Supplies to ensure safety and hygiene. Various hygiene awareness programs in various regions are promoting the use of Disposable Medical Supplies, such as gloves, gowns and drapes. This will lead to creation of opportunities in the Disposable Medical Supplies market in near future. Programs, such as glove awareness week in London, to raise awareness regarding skin health and appropriate use of gloves by the nursing staff will aid the growth of the Disposable Medical Supplies market during the forecast period. Similarly, initiative programs launched by the Royal College of Nursing highlight the importance of using medical gloves to prevent infections. 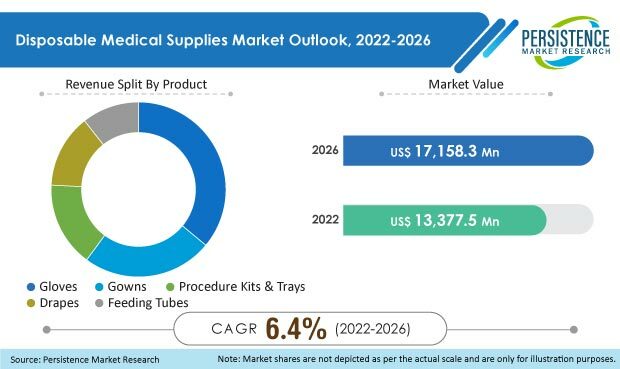 Increasing number of surgeries will fuel the demand for surgical gowns, gloves, drapes, feeding tubes and procedure kits and trays, which in turn, will give a push to the Disposable Medical Supplies market worldwide. The competition section of the report features profiles of key players operating in the Disposable Medical Supplies market based on their market shares, differential strategies, product offerings, marketing approach and company dashboard. Examples of some of the key players featured in this report include Covidien Ltd. (Medtronic PLC. Company), Cardinal Health., 3M, Medline Industries, Inc., Sempermed USA, Inc., ANSELL, Molnlycke Health Care AB, NIPRO, McKesson Corporation and Halyard Health, among others. Mergers and acquisitions, product innovations and partnerships are the some of the key strategies being adopted by the manufactures of Disposable Medical Supplies to gain maximum share in the market. Manufactures are also planning to invest in new facilities to increase productivity. Disposable Medical Supplies are protective equipment used to protect healthcare workers against infections and diseases. Disposable Medical Supplies are worn to prevent cross-contamination between doctors and caregivers and doctors and patients during surgical procedures, medical examination and chemotherapy. Disposable Medical Supplies are an integral part of the infection control strategy and their usage is regulated by FDA as Class I reserved medical devices. The company has conducted a research study on the Disposable Medical Supplies market for the forecast period 2018 to 2026. The report offers a comprehensive evaluation of the business opportunities prevailing in the Disposable Medical Supplies market. The report elaborates the macroeconomic factors influencing the dynamics in the Disposable Medical Supplies market and its futuristic potential. The report offers a comprehensive taxonomy of the Disposable Medical Supplies market based on product type and end users. Based on product type, the Disposable Medical Supplies market is segmented into Drapes, Feeding Tubes, Gloves, Gowns and Procedure Kits and Trays. Based on end users, the Disposable Medical Supplies market is segmented into Tier 1 Hospital (>500 Beds), Tier 2 Hospitals (250-500 Beds) and Tier 3 Hospitals (<250 Beds). The Disposable Medical Supplies market has been analyzed across regions of North America, Latin America, Europe and Asia Pacific Including Japan and MEA. What is the revenue potential of the Disposable Medical Supplies market across regions of North America and Europe? Who are the key competitors and what are their portfolios in the Disposable Medical Supplies market? What are some of the major challenges influencing the growth of Disposable Medical Supplies market? How intervention from the regulatory authorities is shaping the Disposable Medical Supplies market growth? The Disposable Medical Supplies market has been estimated based on supply-demand approach. All the information has been further validated through rigorous primary research (including interviews, surveys, in-person interactions and viewpoints of seasoned analysts) and secondary research (including verified paid sources, authentic trade journals and resourceful databases). The research study on Disposable Medical Supplies market also includes top trends and macro as well as micro economic factors shaping the Disposable Medical Supplies market.